Another year-round staple of my kitchen, this is pickled radish inspired by the Vietnamese do chua pickles, served with noodle dishes, salads and banh mi. I specifically made this to pair with my sweet-hot pickled carrots. 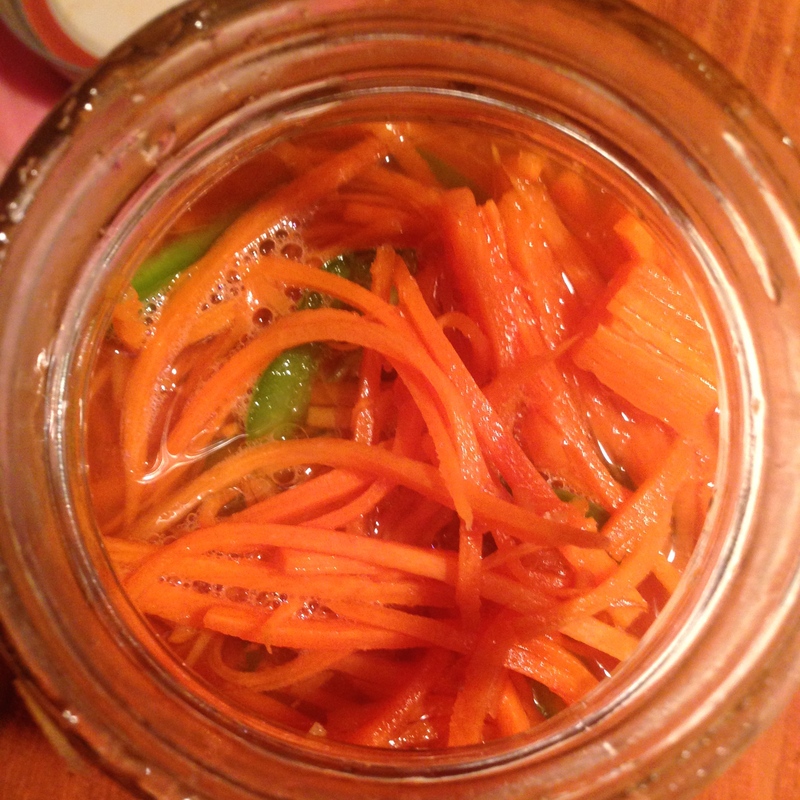 I was introduced to the combination of pickled carrot and radish threads (sometimes with cucumbers added) in the Vietnamese restaurants and sandwich shops of Houston, and have made some variation on do chua ever since. My love of variety gave me the idea a few years ago to separate the pickles into two different treatments, adding chile and more sugar to the carrots and a mix of savory spices to the radish. *You may choose to place these spices in an infusion bag, so that the flavors get into the pickle without having whole spices scattered amongst the pickle. You may also simply leave them in, and enjoy the intense flavor of crunching into whole spices. I like both, and will vary according to my mood or what I plan to serve this with. 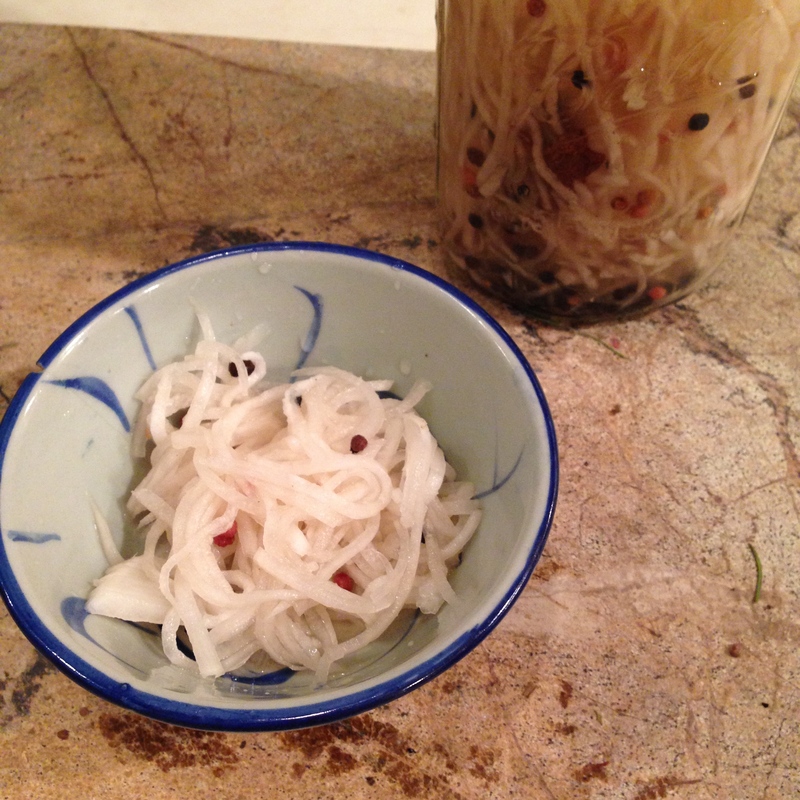 Place the shredded radish into the quart jar with the spices, then pour in the seasoned vinegar while it is still hot. Allow to cool to room temperature, then refrigerate. This is another fairly straightforward quick pickle, once which will be ready to eat once it cools, slightly more flavorful after 24 hours, and which will develop in flavor over time and last at least a month or two. It does, however, come with a warning. Pickled radish has a very strong odor. When I serve this pickle for a buffet of noodles or banh mi, or any other occasion, I always make sure to open the jar a couple of hours before the guests arrive. Another option is to place a serving of the pickle in a small bowl and return it to the fridge, uncovered, which will keep the pickle cool and let it air out. Once you make this pickle, you will quickly understand how important a step this can be. It doesn’t bother me much, but for some the smell will permeate the pickle board and inhibit their appetites. None of the odor really permeates the flavor of the dish, which is spicy and mildly sweet. Excellent served with sandwiches, salads, noodle bowls and so on, either as a component of the dish or an optional garnish. Because of the complex, savory spices used this pickle doesn’t necessarily register as specifically “asian” in flavor and can be used to accompany a wide variety of dishes and cuisines. An especially enjoyable use of them that might not be readily obvious is to pair them with hard cheeses such as gruyere, cheddar or gouda. They also make an excellent foil for sweet or spicy cold meats and sausages. This recipe is so simple I will dispense with the usual list of ingredients and instructions and just describe the process. Just be sure to read it all the way through. We’re not children here. What you need for this is a quart-sized mason jar stuffed all the way full with shredded carrots (preferably on the smallest blade set of a mandolin) and a jalapeño sliced or cut into matchsticks. Usually this entails about 12 oz of carrots, with maybe 1/4 of that going to waste on nubs too small to pass through the mandolin. You can also simply grate them, although the texture will be vastly inferior. You could also practice your knife skills on them and cut long julienne by hand but I am not responsible for any bodily harm. 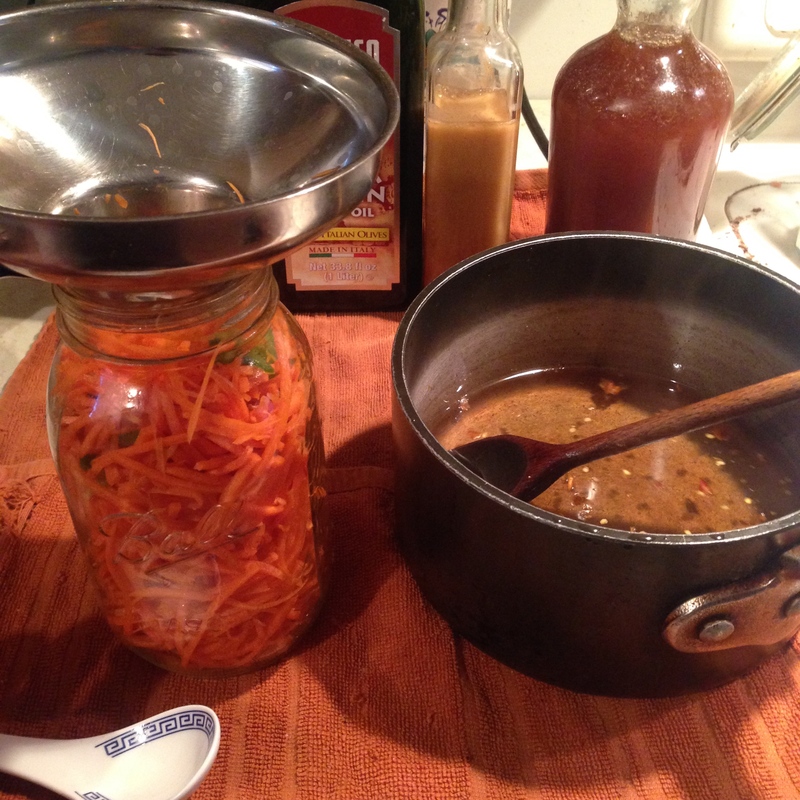 Once you have this mason jar stuffed full of carrots, place a canning funnel in it. If you don’t have a canning funnel, go buy one. Then place a small saucepan on the stove and in it heat 2 cups of seasoned rice wine vinegar, 1/2 tsp salt, 1/3 cup of sugar, and dried, crushed hot red chiles to taste. I use the very hot chinese red chiles and usually grind two of them fresh in a mortar and pestle. 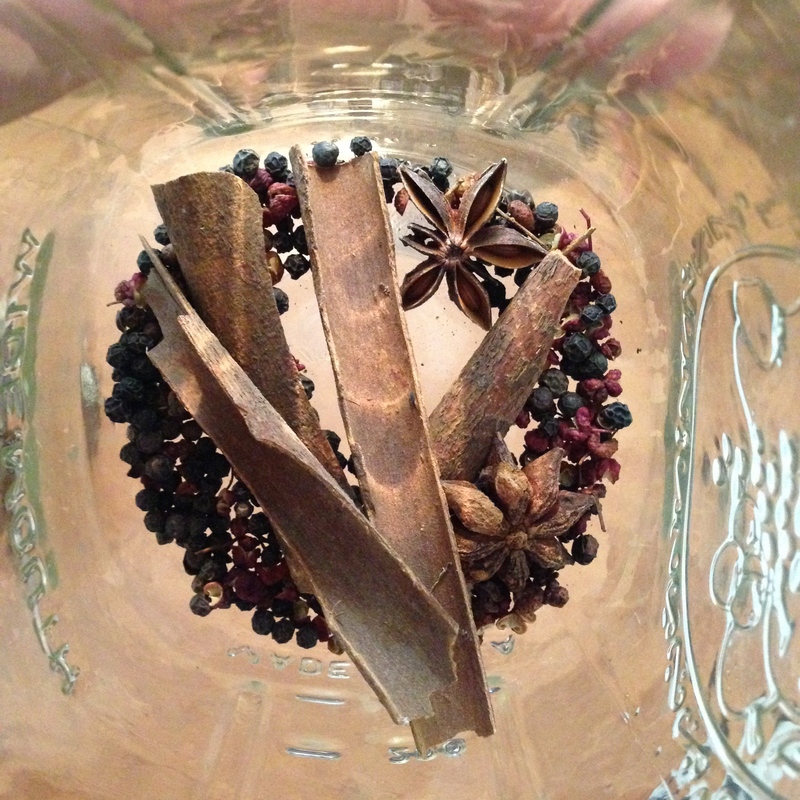 Bring this mess up to something close to a boil, enough to dissolve the sugar. Stir it thoroughly. Being intelligent about the whole process and using how ever many towels you need, bring the still quite hot mixture in the saucepan over to the quart-sized mason jar stuffed full of carrots and pour the mixture in. It should come to about the point at which the “shoulders” of the jar begin. Allow this to sit and cool without capping it. Theoretically you could sterilize both the jar and the cap in this procedure. My experience has been that these things just don’t last long enough around willing eaters to warrant that. Once the jar and its contents are cool, cap the jar and refrigerate. The pickle will be ready in a handful of hours (although of course 24 is best), and it is best served chilled. This is one of the staples of my kitchen, and has proved quite popular with those I make food for. Especially me! These were styled on the Vietnamese do chua and primarily made for banh mi, alongside a spiced daikon pickle that I also make. So it goes without saying that they are a good sandwich topping. They also are great in composed salads and on tossed salads, added to noodle bowls, noodle soups, regular soups, as garnishes, in omelettes, etc. etc. etc. A real kitchen standby, and one that can be a vehicle for your own style and creativity. Tell me what you make with them!